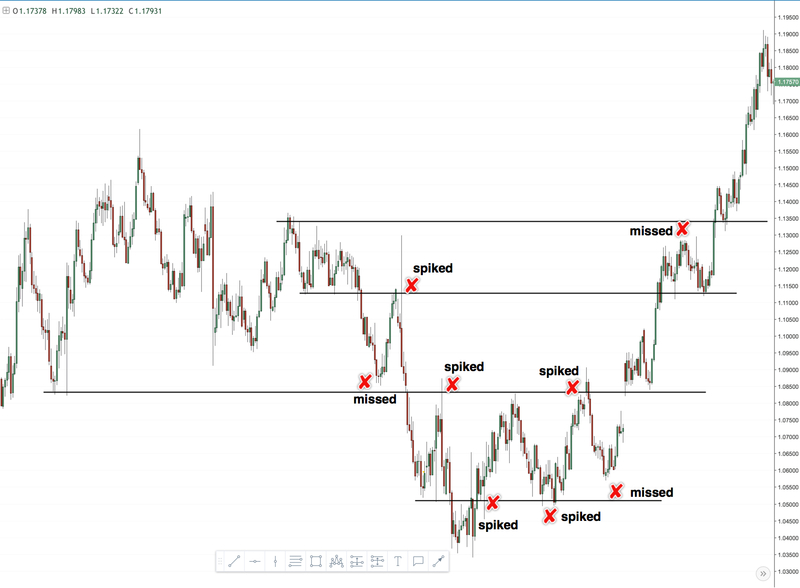 I am going to share with you a simple Fibonacci Retracement Trading Strategy that uses this trading tool along with trend lines to find accurate trading entries for great profits. There are multiple ways to trade using the Fibonacci Retracement Tool, but I have found that one of the best ways to trade the Fibonacci is by using it with trend lines. He developed a simple series of numbers that created ratios describing the natural proportions of things in the universe. And these numbers have been used by traders now for many years! With this strategy, you will learn everything you need to know to start trading with the Fibonacci Retracement tool. You’re going to find out the Fibonacci meaning, Fibonacci algorithm, Fibonacci biography, the Fibonacci formula for market trading, Fibonacci series algorithm, the Fibonacci sequence in nature, along with many other useful facts about this great tool! Price action is among the most popular trading concepts. A trader who knows how to use price action the right way can often improve his performance and his way of looking at charts significantly. However, there are still a lot of misunderstandings and half-truths circulating that confuse traders and set them up for failure. In this article, we explore the 8 most important price action secrets and share the best price action tips. Support and resistance is probably the most popular price action concept, but only very few traders can actually make money with it. The reason is often very simple, although it’s not as obvious at first glance. Most traders just use single, horizontal levels when it comes to trading support and resistance which look great in hindsight but fail during live trading. The reason is that singles lines are no effective way of looking at price movements. 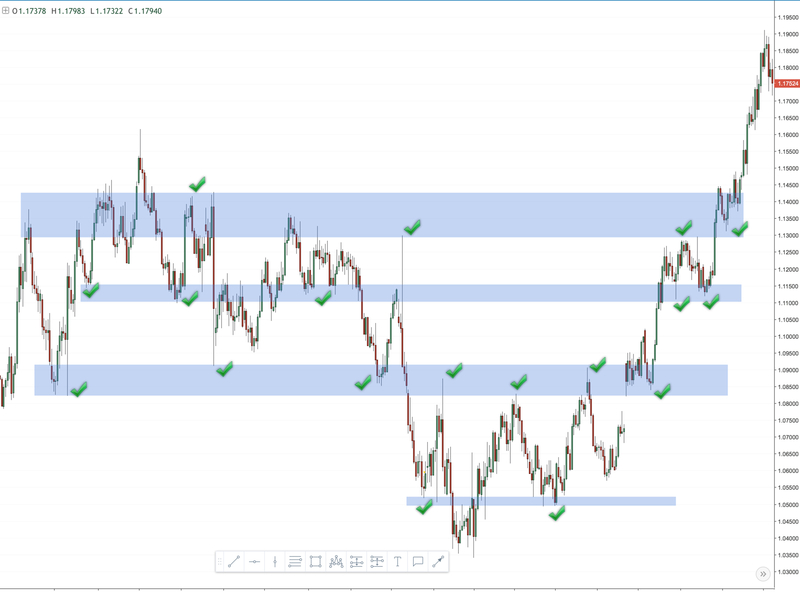 Creating support and resistance zones is much more effective when it comes to understanding price. The screenshot below shows that the trader who just uses a single line either misses trading opportunities when the price does not reach his lines. Or he gets thrown out during volatility spikes; the trader who uses zones instead can filter out the noise that exists in the zones. I hope that this concept doesn’t have to stay one of the price action secrets much longer and more traders will start using this technique. Every successful trader on the planet has one thing in common – he has an edge. By that, we do not mean he has information about a company much before others and takes a position based on the information. On the contrary, the successful trader is on the same footing as anyone else, the big difference is he knows how he will act when he sees his signal on the screen and that gives him the edge over everyone else who will be swinging their bat blindly. Unlike a novice, he will trade only and only if the signal shows itself at other times he is waiting patiently. That is all that it takes to be a successful trader, to know what to do and when to do it. But this is a huge wall to climb for a novice trader as he does not has the patience to wait or the ability of self-control. Successful trading can be broken down into five techniques which have been followed by professional traders for whom it is now second nature. Approach: For a successful trader, trading is his life and passion. It is as much a business as it is a game. How you approach trading decides how you will succeed. A casual approach to trading will result in mediocre results. But if trading is approached as a business with all aspects of it thought through the trader can be assured of success. The common trait among the successful traders is the businesslike approach to trading with a lot of attention to even the smallest details, writing their own logs, taking complete responsibility for their trades irrespective of the outcome. Retail traders generally tend to search for a person or an event to blame for their losses, but a successful trader owns the losses and considers it as part of the game. It is this winning attitude that is the differentiator. Just like a successful businessman takes responsibility for the mistake of his managers and workers and moves on in the search for a solution, a good trader also moves on to the next trade. He knows that this is just one of the thousands trade that he will take in his lifetime. Keeping it simple: A successful trader trades simple strategies. A retail trader, on the other hand, will jump from one strategy to the other if he does not see profits accumulating. He prepares complex entry and exit signals and most times mixes up his strategies. This results in loss of faith in his strategy and he jumps to test some other strategy. A professional trader will have very few and simple sets of rules which he follows and trades. His chart patterns are simple, like a breakout or a retracement entry. Such a trader has very clearly defined rules for entry and exits. A series of losses does not deter him as he knows that his strategy has been built to overtake such days in the long run. He has strong money management rules that will reduce his position in case of series of losses. On the other hand, a retail trader will increase his trading bet in order to retrieve his losses in the next trade, he seeks revenge from the market for taking money from him. It’s OK to be wrong: Not reacting to losses takes more energy and time for a trader than to search for the right strategy. It is only after years and hundreds of trades that a trader learns how to be emotionally neutral in any situation. Many professional traders follow the trend following strategies which normally has a win-loss ratio of 0.4. In other words, six out of every ten trades that a trend follower takes will result in a loss. A retail trader will be crestfallen with such a ratio and would abandon the strategy at a time when the next trade would have resulted in a huge profit. The professional takes these losses in his strides and knows that they are in line with the long-term averages. Taking losses are important of trading, the trick is to keep them small so that one or two profitable trades will take care of the accumulated losses. Since trading is a game of uncertainties it is obvious that there will be occasions when the price moves in a different direction than the one suggested by the pattern or the signal. How one reacts to these uncertainties determines the winner in the long run. Trading consistently with discipline and tweaking the strategy after learning from the losses will in the long run help overcome uncertainties. Plan your trade and trade your plan: Trading, like any competitive sports, requires more work out of the playground rather than in it. For a day trader, there is little time to plan as the prices move rapidly. He has to have a plan in place and trade according to the plan, the strategy has to be so engraved in him that it becomes muscle memory. Last minute thinking will only lead to losses as well as confidence. Most traders, irrespective of the time-frame they trade also do not change their trading plan and second guess when the time for action comes. Continuous improvement: One of the key aspects of all successful traders is that they seek to improve their performance continuously. They are not competing with anyone but with themselves and the way they do this is by keeping their own logs. This way they know their mistakes that need to be rectified, their previous track record as well as how the strategy has performed at the various points of time. They are learning aspects of trading and psychology and try to incorporate these in their trading. A successful trader is always a student of the market learning with each uncertainty and ticking the checklist of having encountered another surprise so that next time he knows how to react to it. Making money consistently in trading requires discipline and consistently more than selecting a trading strategy. The techniques used by successful traders suggest that after the initial work of selecting a strategy is done they pay more attention to the psychological aspect of trading. Ultimately it is how one reacts to unpleasant surprises is what decides the winner from the losers. This is true for life as much it is for trading. This article appeared on tradesmartonline.in and is available here.